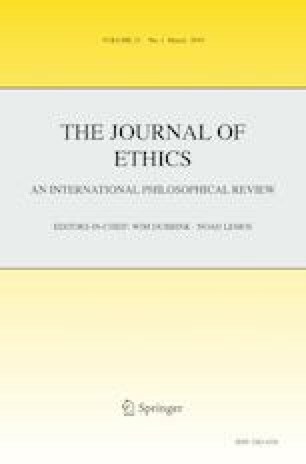 The Journal of Ethics was founded in 1997 by Professor J. Angelo Corlett and for over 20 years he served with distinction as its editor-in-chief. Under his leadership, the journal has published high-quality papers in ethical theory and related fields, such as legal philosophy, social and political philosophy, and action theory. Outstanding philosophers have published their work in this journal. These include Simon Blackburn, Gerald Cohen, Ronald Dworkin, John Martin Fischer, Harry Frankfurt, Ted Honderich, Christine Korsgard, Martha Nussbaum, Peter Singer, and Peter van Inwagen. Those who have enjoyed the journal for the past 20 years owe a debt of gratitude to Professor Corlett for his stewardship and for his dedication to preserving high standards of scholarship. As the new co-editors, we would like to introduce ourselves and our vision for the journal. Professor Wim Dubbink is Professor of Philosophy at The University of Tilburg. He specializes in applied ethics, political philosophy, and Kantian moral philosophy. Noah Lemos is Professor of Philosophy at The College of William and Mary and he specializes in ethics, value theory, and epistemology. We hope to maintain the high standards set by Professor Corlett and to continue covering the range of topics traditionally covered by the journal. We also aim, however, to broaden the scope of the journal to include outstanding submissions in applied ethics, the continental tradition, and those dealing with issues at the intersection between science and ethics. Currently, the journal is published four times a year. In broadening the scope of the journal we anticipate that we will move eventually to publishing six times per year. In order to accomplish this, we have added several Associate Editors who will also broaden the journal’s editorial expertise. The new Associate Editors are Amanda Cawston, Tilburg University, The Netherlands (Political Ethics); Paul Sheldon Davies, William and Mary, USA (Science and Ethics); Geert van Eekert, University of Antwerp, Belgium (Normative Ethics); Mariëtte van den Hoven, Utrecht University, The Netherlands (Applied Ethics); Jens Johansson, Uppsala University, Sweden (Normative Ethics); Thomas Nys, University of Amsterdam, The Netherlands (History of Ethics); Hille Paakkunainen, Syracuse University, USA (Metaethics); Martine Prange, Tilburg University, The Netherlands (Hermeneutic Philosophy and Ethics); Neal Tognazzini, Western Washington University, USA (Action Theory and Responsibility); Holly Wilson, Louisiana State University at Alexandria, USA (Normative Ethics). Finally, the journal policy will be one of timely evaluation of submissions and to treat all authors with courtesy and fairness.